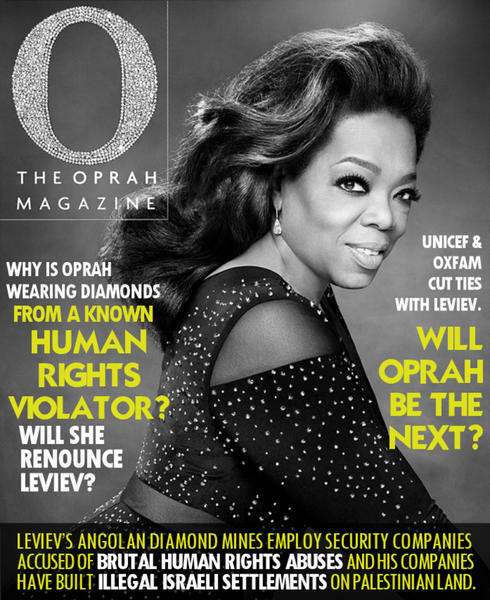 US megastar and social justice philanthropist Oprah Winfrey wore diamond earrings made by Israeli billionaire Lev Leviev on the cover of the May 2015 edition of O, the Oprah Magazine. She wore the earrings despite the fact that Leviev’s companies have been involved in brutal human rights abuses in the diamond industry in Angola and in the construction of Israeli settlements on Palestinian land. Please join the call for Ms. Winfrey to support the human rights of Angolans and Palestinians. July 1 - US megastar and social justice philanthropist Oprah Winfrey wore diamond earrings made by Israeli billionaire Lev Leviev on the cover of the May 2015 edition of O, the Oprah Magazine. She wore the earrings despite the fact that Leviev’s companies have been involved in brutal human rights abuses in the diamond industry in Angola and in the construction of Israeli settlements on Palestinian land. On May 29, Adalah-NY emailed the letter below, signed by nine organizations and 34 individuals from the US, Palestine, Israel and South Africa to: Ms. Winfrey; Sheri Salata and Eric Logan, Presidents of the Oprah Winfrey Network (OWN); Lucy Kaylin, Editor in Chief of O; and Gayle King, Editor at Large of O. The letter calls on Ms. Winfrey to demonstrate that she does not support Leviev’s abusive business practices by publicly distancing herself from his companies. Following email exchanges and phone calls between letter signers and executives from O and OWN over the course of more than three weeks, Ms. Winfrey’s representatives have failed to provide a promised response to the letter. Please join the call for Ms. Winfrey to support the human rights of Angolans and Palestinians. Fill out and submit the form on the link below in order to sign the letter and email a copy to: Chelsea Hettrick, Communications Director at OWN; Lucy Kaylin, Editor in Chief of O; and Karla Gonzalez, Assistant to Lucy Kaylin at O.